The 44th Annual Antique Auto Show and Flea Market is coming to Veterans Memorial Park from 9 a.m. to 4 p.m. Saturday and Sunday, Aug. 12 and 13. Spectator admission is free for this popular event on the shore of beautiful Lake Charlevoix. 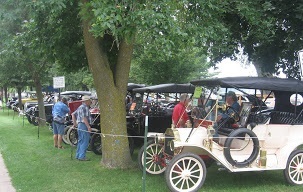 The Boyne Country Region Antique Automobile Clubs of America sponsor the auto show, which includes two classes of antique cars and another class of muscle cars and hot rods. More than 40 vendors are expected for the giant flea market, organized by the Boyne City Fire Department, which also operates the food concession. For further information, contact Boyne City Fire Department, 319 N. Lake St., Boyne City MI 49712, phone 231-582-3642. 9 a.m. to 4 p.m. Saturday and Sunday, August 12-13, 2017 - the second weekend of August every year.